To complement the essays in the Irving Penn: Paintings catalogue, we have combed through the foundation’s archive to unearth details about specific works featured in the publication. As a young man, after graduating from the Philadelphia Museum School of Industrial Art in 1938, Irving Penn harbored dreams of becoming a painter. In 1941–42, he spent a year in Mexico painting, but he found his results to be disappointing and destroyed all but a small group of drawings. Despite this repudiation, drawing continued to play an important role for Penn in his subsequent work as a photographer as he worked out an image and its composition. Following his retrospective exhibition at The Museum of Modern Art in 1984, Penn returned to painting after more than forty years. He developed unique working methods, inspired by his experiences printing photographs in platinum and palladium metals. In the period between 1986 and 2000, he photographed drawings to convert them into the underlying structure for paintings. By reproducing the drawings as platinum-palladium prints, he enlarged their scale and emphasized the graphic quality of their lines. Penn then used the resulting print as a matrix, painting over it using combinations of watercolor, ink, dry pigments, and gum arabic. After 2000, when Penn ceased platinum-palladium printing, he began making inkjet prints from digitally scanned drawings. He also produced freehand paintings using no photographic or printing processes. Examples of all these methods will be on display in the exhibition at Pace Gallery, at 32 East 57th Street, New York, from September 13 through October 13, 2018. After his 1984 retrospective at MoMA, Penn returned to drawing and painting as a serious creative endeavor for the first time in more than forty years. By 1986, he had developed an idiosyncratic technique of photographing a drawing to enlarge and print in platinum-palladium, using the resulting print as the underlying structure for a painting. 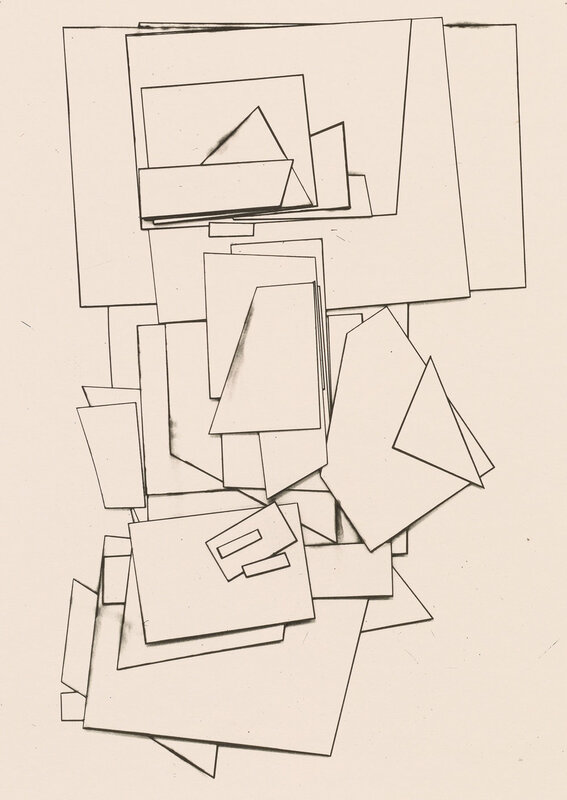 His drawings were often graphic compositions of geometric shapes, although he also used this technique with figurative drawings. Pictured here working in his studio in Sweden, Penn paints over one printed matrix in ink, watercolor, and dry pigment while others dry in the background. He also added gum arabic to introduce craquelures, bubbles, and scales to the surface of his paintings. 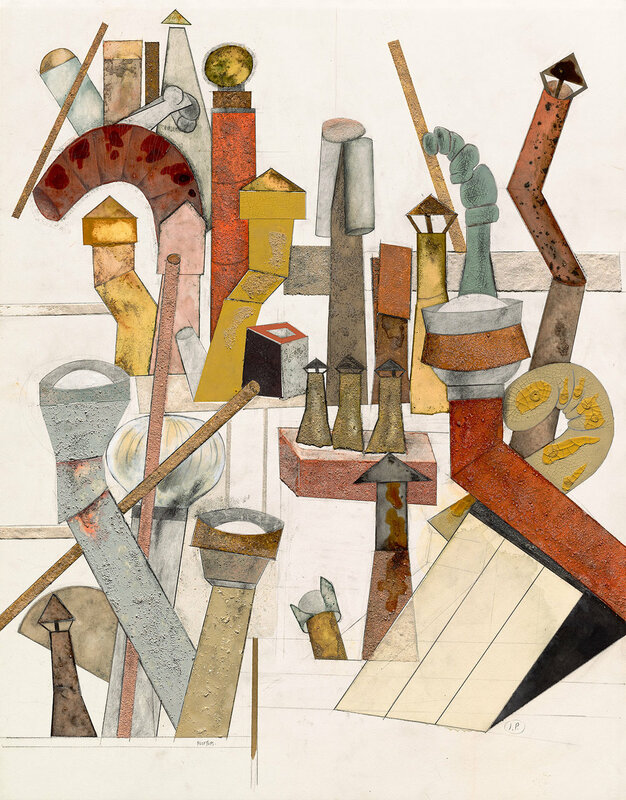 In this composition, which some interpret as a self-portrait, the elements of an enigmatic tabletop still life lock tightly into place, overlapping like a collage or as if pulled together by a central magnetic force. Although the yellow vessel on the right inches precariously off the table’s surface, there is a sense of balance. The angular base of the table and the graphic symbols that rise vertically on the left suggest the roughly hewn wooden bases Brancusi made for his sculptures, or his Endless Column. While the elements of the still life remain unidentified, they appear heavy with significance, presided over by the single watchful eye of the alchemist. In centuries past, alchemy was concerned with the transmutation of elements and the search for an elixir that could grant immortality. Art has the power to confer a certain form of immortality: as Penn said in 1972, “The fascination of photography is to make an image that will survive me, to record something that has moved me and that can. . . move other people, people whom I have never met.” Throughout his career, Penn welcomed the occasions when precision and control were met with unexpected revelations, acknowledging the importance of chance for invention. Like a totem, the figure of the alchemist resonates with Penn’s experience of the elusive and, at times, seemingly magical process of creation. 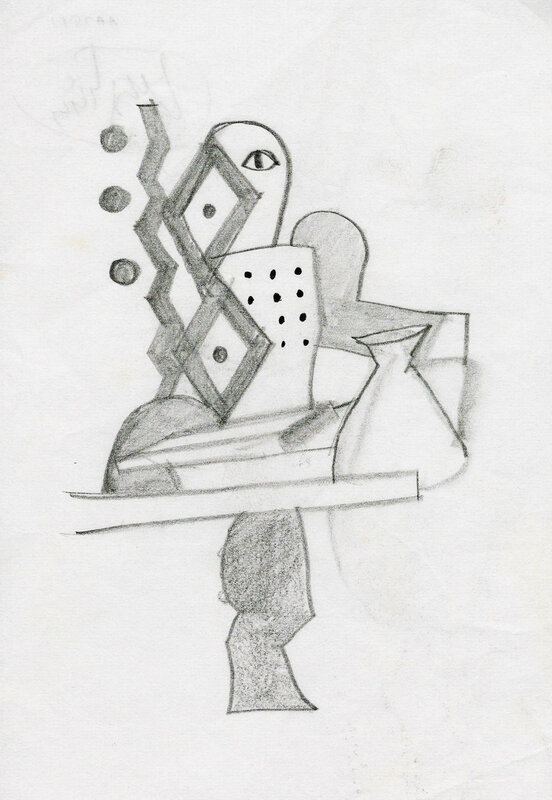 The sketch for this work is very small: made in graphite on a slip of notepad paper, it measures only 6 × 4 inches. Penn scanned the drawing to make an enlarged inkjet print approximately four times larger, which he then worked over in watercolor, sand, and gum arabic. Although the composition was already complete in the small sketch, Penn made significant changes by increasing the scale, transforming the texture and tone of the lines, and animating the work with color. In 1966, Penn made an unusual series of photographs showing cards of various sizes arranged in overlapping stacks. In the platinum-palladium prints he made of this series (see Cards 2), there is little that is recognizably photographic: these are sparse compositions of geometric shapes reduced to sharply defined lines. To create this effect, Penn photographed the cards with their edges outlined in black, and presumably used orthochromatic graphic arts film to accentuate the lines and eliminate detail. Two decades later, just as he was beginning to paint again, he revisited these prints and used some as the underlying structure for paintings. 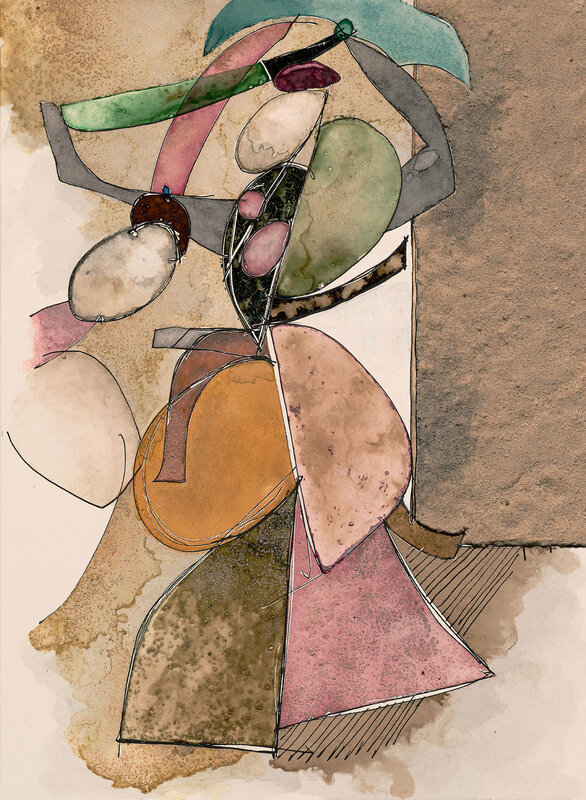 With the addition of pigment, watercolor, inks, and gum arabic, the starkness of the initial composition is transformed and given an entirely new character. While the platinum prints emphasize the forms and tension in the arrangements, the rich hues of the paintings introduce depth and rhythm to counterbalance the abstraction of the compositions. Penn made approximately a dozen paintings with card prints as the underlying matrix. The graphic consistency of the compositions allowed him to explore the effects of different juxtapositions of color and tone on the same base. 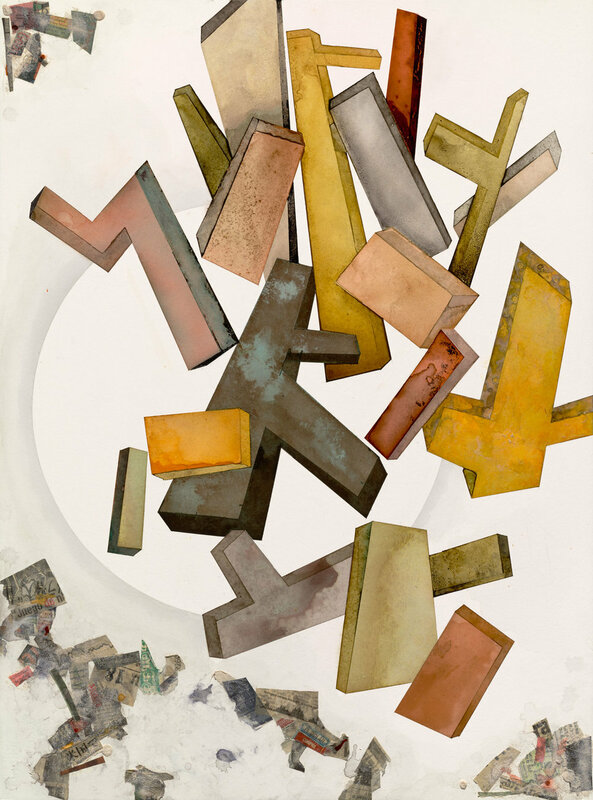 When he first revived his painting practice, working in series was his preferred approach: in addition to the cards, he produced numerous spiral compositions and mushrooms in this first phase of his return to painting. The Cards painting was made using a print of the same composition as seen in Cards 2, rotated 180 degrees. Mushrooms were the subject of many of Penn’s paintings. They interested him long before his return to painting in the late 1980s, as a photograph titled Swedish Mushroom, made in 1964, attests. Printed in platinum-palladium, it is a tightly framed view of a mushroom on the forest floor, surrounded by moss and lichen. 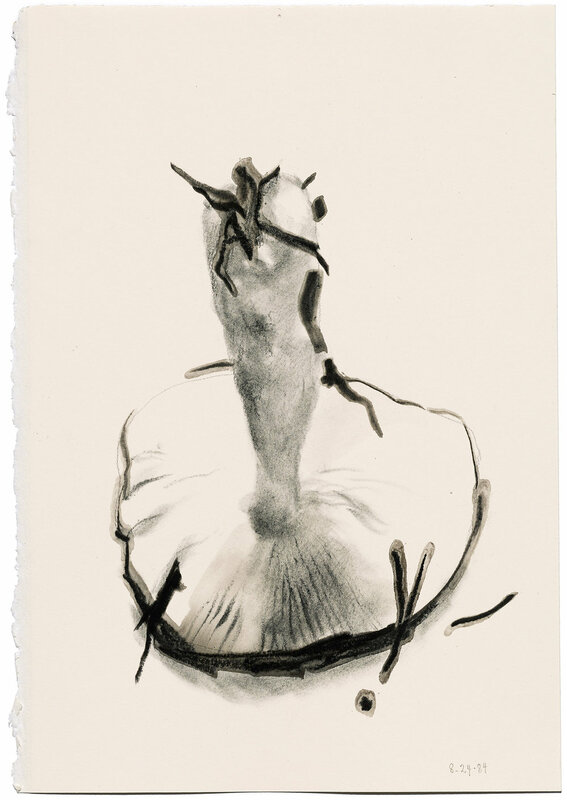 The reflective surface of the dew pooled in the mushroom’s cap gives the image a sensuous and otherworldly air, emphasized by the rich tones of the platinum-palladium print. 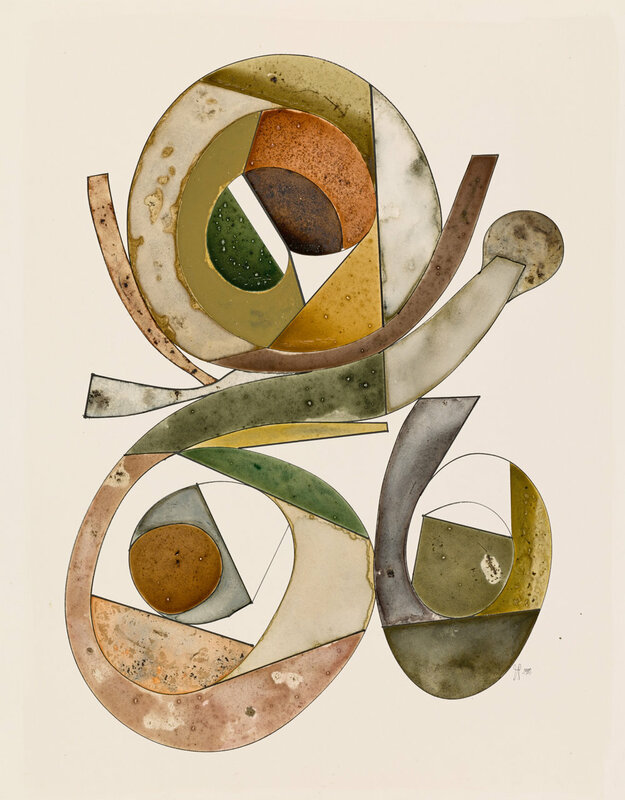 In an extensive series of mixed-media paintings begun in the late 1980s, Penn explored a simplified mushroom form, sliced into cross-sections, with sharply defined lines emphasized through platinum-palladium printing. For these paintings, he preferred a schematic, graphic mushroom motif to the delicate textures of fungi captured in the earlier photograph and drawing. 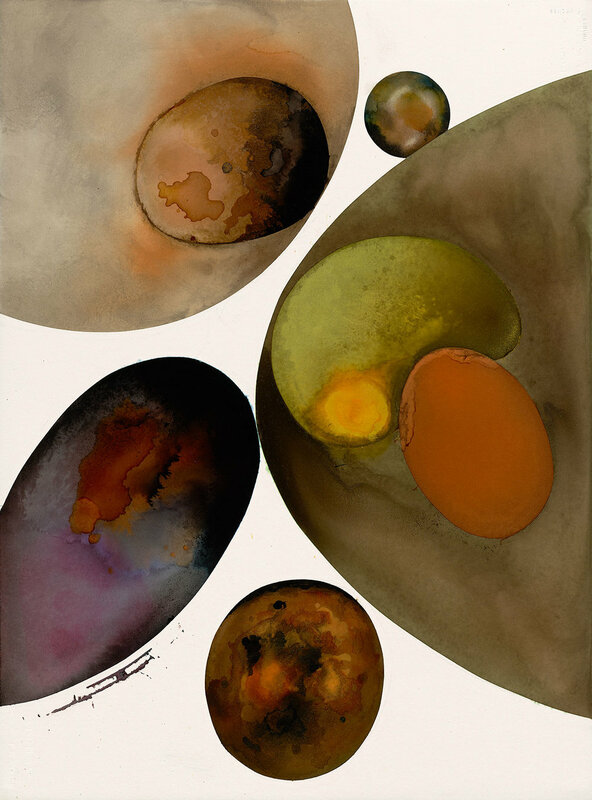 The shape seen in the paintings is more closely related to a photograph from 1966, Still Life of Mushrooms.Penn embraced the ability his painting practice gave him to simplify forms and selectively emphasize lines, before introducing subtleties in the surface textures of the pooled inks and pigments. This composition of overlapping earthy tones suggests an aerial photograph of farmland. Details from the painting offer insight into Penn’s approach: working section-by-section, he delineated sharp-edged areas using a low tack tape, then pooled India ink and watercolor within each boundary, leaving the materials to dry slowly before moving onto the next segment. The resulting fields of color are characterized by tidemarks and accents along the edges where the pigments concentrated as they dried. Penn carefully layered and mixed colors, resulting in a remarkable variety of hues across the surface of the painting. 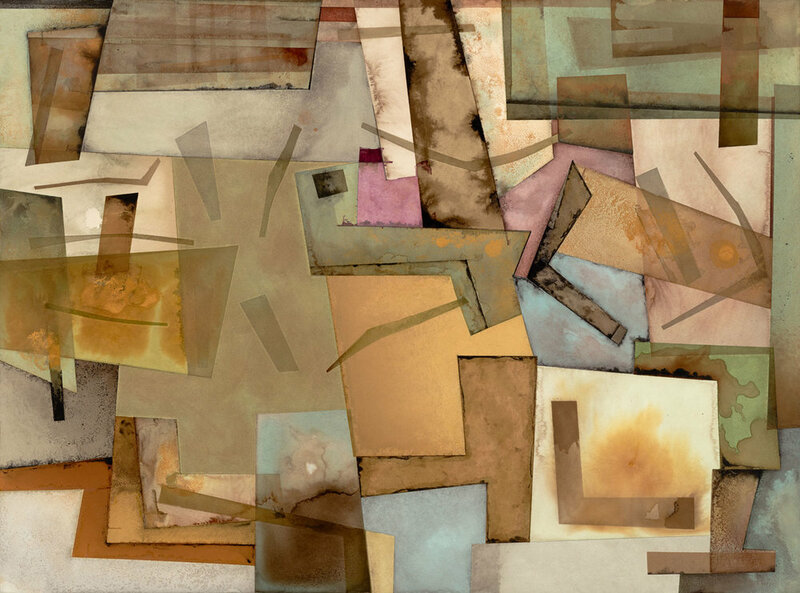 The patches of color suggest plots of land of varying geometric and rectangular shapes, yet this work approaches abstraction, going beyond nature into a landscape of the imagination. In the last years of his life, as Penn scaled back on his photographic activities, the solitary, contemplative activity of painting took on increasing importance and grew to become his main creative outlet. He enjoyed the tactile pleasures of working with his materials and the opportunity to slowly and deliberately experiment with new forms. The freehand paintings he made in the 2000s using no printing methods are a dynamic departure from the earlier works made over printed matrices. These late paintings show the vitality of his creative vision, constantly renewed and in search of new possibilities, yet consistent in character. The majority of Penn’s paintings feature his preferred background of unencumbered white space, but in this striking work, three voluptuous, colorful figures are set against a densely pooled, squid-ink shade of black. The trio appears to float against the darkness, and each one of the shapely, rounded fin-tailed forms is defined by a different color. A sense of harmony exudes from the arrangement, and the state of equilibrium it depicts among the figures is reminiscent of compositions of the three graces in historic paintings and sculptures. This painting was made in 1992, shortly after the death of Penn’s Swedish-born wife, Lisa Fonssagrives-Penn, and the mermaids are thought to be a poignant reference to her and her sisters. One of Penn’s most famous photographs of Lisa is Rochas Mermaid Dress, a fashion photograph made in Paris in 1950, just before they were married. That celebrated image could be the origin of the mermaid reference, or Penn may have drawn on the figure of the mermaid in folklore and fairytales for this imaginative portrayal. He made two other paintings that year that share the same motif: A Gathering of Mermaids and In Eden Pond. These titles lend a magical, idyllic tone to the compositions. The mermaid series seems to relate to paintings Penn made in the late 1980s like Undersea Creature or Pond Water, works in which spiraling organisms inhabiting bodies of water convey an abundance of life. This painting reflects Penn’s attraction to humble subject matter. He may have had in mind this Van Gogh painting of a pair of humble, worn-out shoes. Both works seek to dignify an essential everyday object that is commonly overlooked. Penn admired Van Gogh, and cited his name when reflecting on his artistic influences. As Penn’s preliminary sketch for the painting was enlarged to make the underlying print, the modest shoe is similarly elevated in the painting. Vincent van Gogh, Shoes, 1888. Oil on canvas. The Metropolitan Museum of Art, New York. The shoe in Penn’s painting is extracted from its environment, isolated, flattened, and examined from above. This presentation is reminiscent of his Street Material series: as in the photograph Mud Glove, Penn creates a stark but tender character study of a simple, weathered object. In the painting, Penn mixed sand into the pigment to achieve a gritty texture that suggests the rough, worn texture of the leather. Penn included an old shoe in a still life photograph from 1980, titled Still Life with Shoe, where it is shown frontally, like in the painting, and anchors the left side of the composition. Where the sole detaches from the toe of the shoe, it makes a shape that resembles the wavering gray area at the upper right edge of the shoe in the painting. Whether or not Penn was thinking of the same shoe, the painting shows the appeal of this medium for Penn, which allowed him greater whimsy and freedom in the description of things. This painting depicts a system of shapes connected in a spiral, evocative of both the physical organization of space shared by people living as a group, as well as the abstract ties that bind them to one another by virtue of living together. It is likely that Penn drew inspiration for African Village from Takienta or Tata Somba houses, which he had seen while traveling in Dahomey (present-day Benin) in 1967. These are constructions of the Somba or Batammariba people, native to a region split between Togo and Benin. Circular dwellings resembling small fortresses, these fortified compounds often have two stories, with granaries on the upper floors. They are grouped in villages, clusters which are separate but related as part of a larger system. Enclosed yet interconnected, like the spiral shape in Penn’s painting, this architecture is reflective of the broader social structure. In 2005, the same year he made this painting, Penn published a book revisiting his trip to Dahomey, which features a series of photographs he had made of Legba shrines. He also included another photograph from that trip, showing Tata Somba houses in the northwest corner of the country. Diving back into earlier work for the book project appears to have prompted the reflection that Penn explored in African Village as well as in two other paintings he made the same year, titled Village and Community. The methods Penn used for constructing his paintings may have been exacting and precise, but he adapted them freely to best suit his needs for each work. This painting is a rare case where Penn drew from photographs for a painting, rather than photographing his drawings for printing. To create this work, Penn enlisted the help of a studio assistant to take 35mm photographs which he then used as reference material for sketching the composition. Penn was interested in depicting the dense clusters of chimneys which he liked to observe from his New York apartment. His concern was not to recreate the arrangement exactly as it was documented in the photographs. Instead, he used the photographs as guides to capture a general sense of the overlapping, angular forms crowding the rooftops. He sketched the composition by hand, and traces of the graphite underdrawing reveal that he revisited the position of the chimneys multiple times before finalizing the dynamic arrangement. The resulting painting is lively and seems almost like a portrait of this boisterous group of forms. Compared to two other paintings Penn made of chimneys huddled together side-by-side, this composition, punctuated by diagonals, describes more vividly the deep receding space of a sequence of rooftops. In addition, by mixing sand in with the ink, watercolor, and dry pigment, Penn built up a variety of textures that give the viewer a tactile sense of the rusted surfaces and grit of the urban New York landscape. Penn frequently used sand in his paintings, typically mixing in small amounts with his pigments and watercolors to add a touch of grit to areas of color. In certain works like Saber Dancer, Penn built up dense sections of sand, which offset the color and create a sense of space through texture. Picasso and Braque, artists that Penn greatly admired, both incorporated sand in their work in the 1930s (see, for example, Picasso’s Bather and Profile, 1930, or Braque’s Fruit, Glass, and Mandolin, 1938). For Still Life with Skull, Bottle, and Sewing Machine, Penn used one type of velvety gray sand for the sewing machine arm, but selected a different kind, dense and gritty, for the skull. The sand used for the skull may have been bird gravel, which Penn is known to have used in his paintings because it was washed and ground, and incorporated charcoal and oyster shells, which added further variety to the texture. This still life painting resonates with Sewing Machine with 13 Objects, a photograph from Penn’s Archaeology series featuring objects arranged in a row much like those depicted in the painting. Whereas the photograph is a study of light rendered in the rich black and white tones of the platinum-palladium print, in the painting, Penn endows each element with a distinct graphic personality, translated through contrasting textures and colors as well as through the lively, rough quality of his lines. 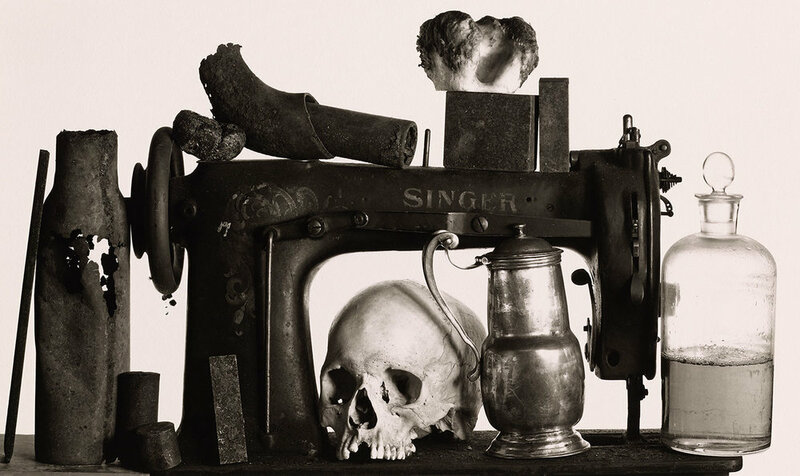 Irving Penn, Still Life with Skull, Bottle, and Sewing Machine, 2005. Watercolor with sand and gum arabic over inkjet print on paper. © The Irving Penn Foundation. The oblong forms in Collision crowd the picture plane, cut off at the edges like a full bleed image. As the edges approach one another or just begin to touch, the negative space between the forms is animated with a sense of slow, unavoidable, magnetic movement. This framing makes the forms appear massive and monumental, whether they are planets about to collide or cells with nuclei examined in close-up under a microscope. In his paintings, Penn was repeatedly drawn to scientific themes and extremes of scale, from the infinitesimal to the astronomical. 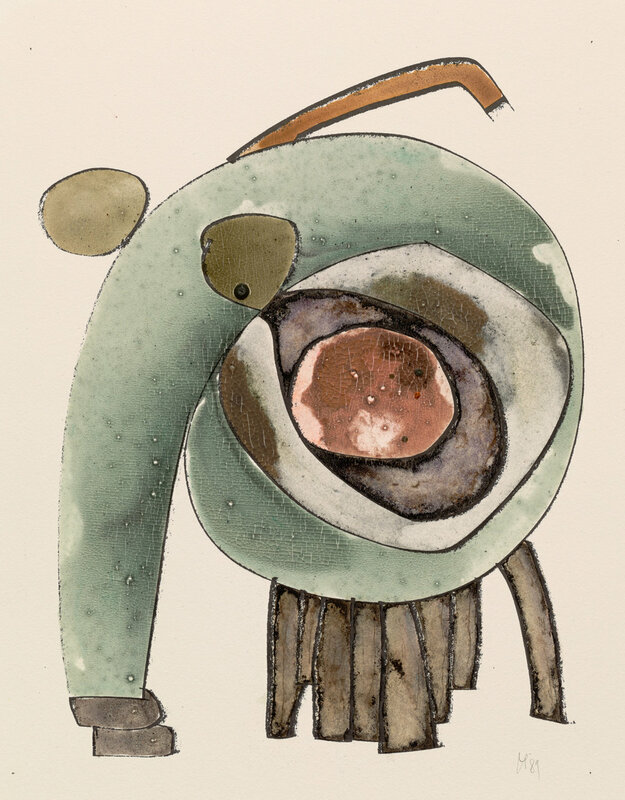 The cosmos had interested Penn since the 1930s, as evidenced by his earliest surviving series of drawings, which he revisited and published as a book in 1999 titled The Astronomers Plan a Voyage to Earth. Several of his later paintings explore imagery related to outer space, including this painting, A Section of Space. 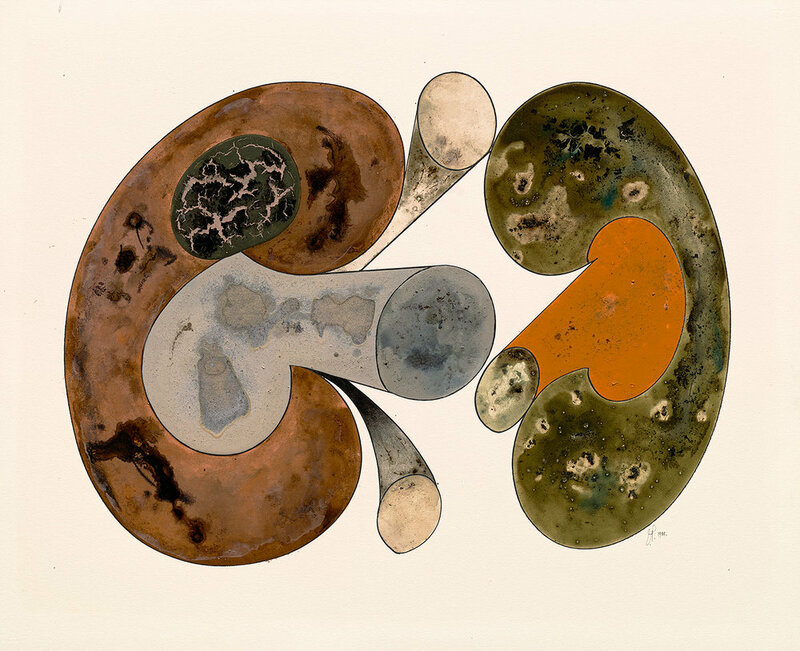 Other works feature imaginative takes on microscopic cellular forms and organisms, with references to Leeuwenhoek and Spallanzani, 16th- and 17th-century scientists who studied microscopic life forms. Penn made Collision in 2006, at a time when his photographic activities slowed down and he devoted greater energy to painting. During this productive period, he made mostly freehand works, without printed matrices. He enjoyed the slow quiet of the work, which was like meditation and opened an area of freedom and solitude that was very different from the collaborative nature of photographic work in the studio. Irving Penn, A Section of Space, 2007. India ink over graphite on paper. © The Irving Penn Foundation. Around the edges of Before the Full Moon, overlapping newspaper clippings in English, Spanish, Hebrew, and Japanese are arranged in a collage, sprinkled with sand and light-colored splatters of light-colored ink. Many of these news clippings share a financial theme: there are graphs, mentions of the S&P 500, and clippings about buying dollars, as well as references to newspapers, pictures, and hope. Together, these fragments suggest the frenetic cacophony of international markets. In the lower left corner, two particularly noticeable clippings stand out, one in Spanish and one in Japanese. Combined, they read “Game of America.” This may be a purely serendipitous juxtaposition, but there’s no doubt Penn took care to select thematically related clippings. These are the marginal elements surrounding the central composition, a group of geometric blocks of different colors suspended in freefall, silhouetted against the white orb of the moon. Similar tumbling geometrical forms appear in another paintings Penn made that same year, A Temple Destroyed. Whereas that title gives a sense of destruction after the fact, in Before the Full Moon, there is a suggestion of imminent destruction, as if the full moon was a signal of impending chaos, or a reckoning. Penn appears to have been preoccupied by these themes in 2006, as other paintings from that year are titled Debris, Explosion,and The City Destroyed. The biblical story of the Tower of Babel, from the Book of Genesis, tells of a time when humankind was united and all spoke a single language. As punishment for attempting to construct a tower that could reach the heavens, they were condemned to be divided and scattered, both geographically and linguistically, no longer able to communicate or understand one another. 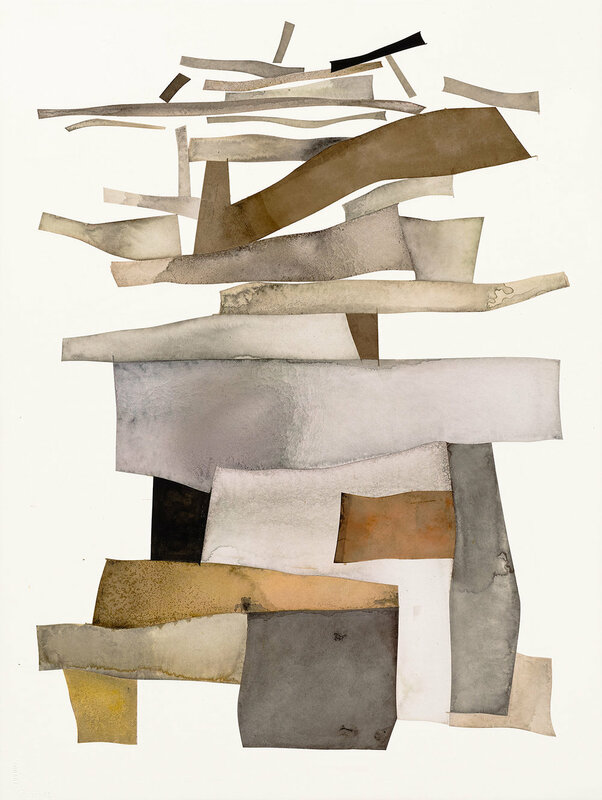 In Penn’s painting, the tower is solid at the base but begins to unravel and lose balance at the top, the elements already splintering. 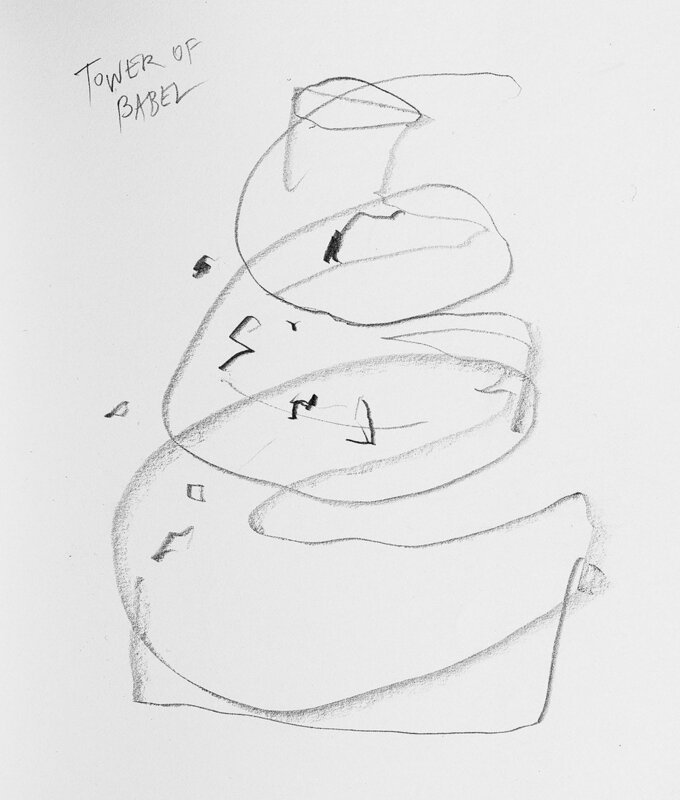 A preparatory sketch reveals that Penn was initially contemplating a spiraling structure, reminiscent of the famous painting by Pieter Bruegel the Elder, The Tower of Babel, dated 1563. A note he made on one of the pages preceding this sketch documents that he was fascinated by ways of depicting the disintegration of communication: “BABEL BABBLE Juxtaposition of bits of newspaper letters.” Penn also used newspaper clippings to suggest cacophony in his painting Before the Full Moon, made the same year. For a time, Penn considered making a photograph inspired by the myth of Babel. He made a sketch showing a man in profile, with a collage of letters from different languages spurting from his mouth. All these traces help us to reconstruct Penn’s interest in this age-old theme. As he explored ways to render it visually, he showed a mind that thrived on constant experimentation. Penn studies at the Philadelphia Museum School of Industrial Art (now the University of the Arts, Philadelphia). Travels to Mexico to paint for a year. Penn destroys the paintings before returning to New York. Begins work at Vogue with Alexander Liberman. During their collaboration, which continues for the next five decades, they frequently make sketches while planning and discussing photographs. Penn photographs abstract compositions of stacked cards for printing using the platinum-palladium print process. He will revisit these twenty years later to use as matrices for paintings. 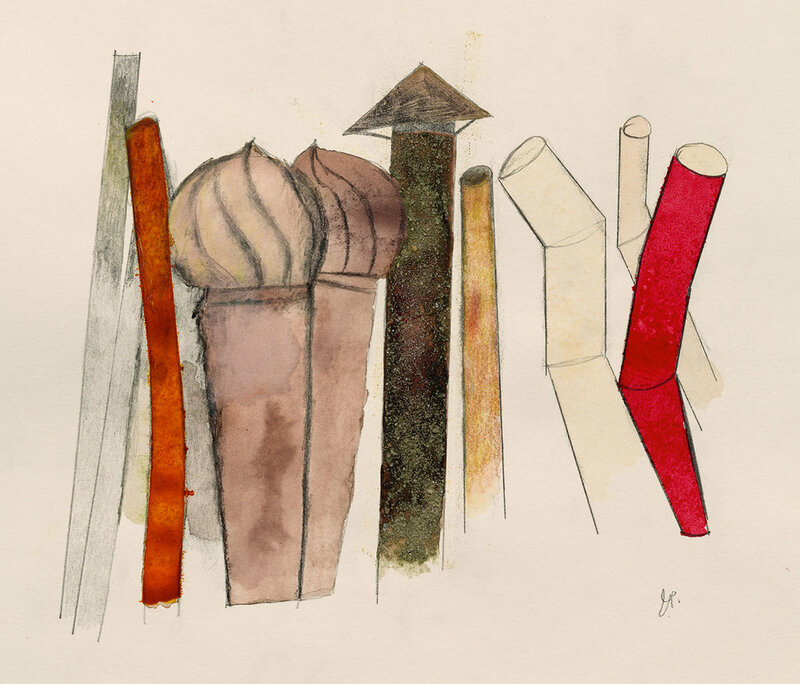 Retrospective at the Museum of Modern Art includes two early drawingsfrom 1939–42 and two drawings made in 1978. Penn resumes painting and drawing. Develops technique to photograph a sketch to print in platinum-palladium and use as a matrix for a painting. First inventory of paintings and drawings prepared. Publication of Drawings and Astronomers Plan A Voyage To Earth books. Last drawings printed in platinum-palladium. 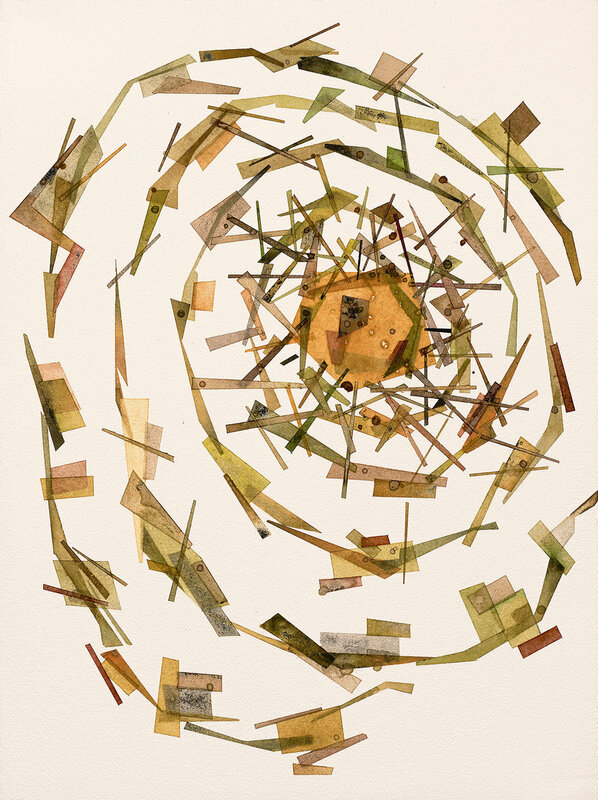 Paintings made using scanned drawings, matrices printed in inkjet. Paintings without any printing techniques. Two paintings and three drawings included in The Metropolitan Museum of Art’s “Irving Penn: Centennial” retrospective exhibition. First exhibition focusing on Penn’s paintings, at Pace Gallery. A 104-page hardcover catalogue with 47 illustrations, including 39 full-page reproductions, has been published to coincide with the exhibition. It features the first scholarship on Penn’s painting practice, with essays by writer and curator, David Campany, and legacy program manager at The Irving Penn Foundation, Alexandra Dennett; with afterwords by Arne Glimcher, Pace Gallery founder, and Peter MacGill, Pace/MacGill Gallery founder. Produced by Sandra M. Klimt, Klimt Studio, Inc. and designed by Malcolm Grear Designers, the catalogue is printed by Meridian Printing with four-color separations by Martin Senn. It is published by Apparition, an imprint of The Irving Penn Foundation,in association with Pace Gallery and Pace/MacGill Gallery.